In this jarring look at contemporary warfare and political visuality, renowned anthropologist of violence Allen Feldman provocatively argues that contemporary sovereign power mobilizes asymmetric, clandestine, and ultimately unending war as a will to truth. Whether responding to the fantasy of weapons of mass destruction or an existential threat to civilization, Western political sovereignty seeks to align justice, humanitarian right, and democracy with technocratic violence and visual dominance. Connecting Guantanamo tribunals to the South African Truth and Reconciliation Commission, American counterfeit killings in Afghanistan to the Baader-Meinhof paintings of Gerhard Richter, and the video erasure of Rodney King to lynching photography and political animality, among other scenes of terror, Feldman contests sovereignty's claims to transcendental right -whether humanitarian, neoliberal, or democratic-by showing how dogmatic truth is crafted and terror indemnified by the prosecutorial media and materiality of war. Excavating a scenography of trials-formal or covert, orchestrated or improvised, criminalizing or criminal-Feldman shows how the will to truth disappears into the very violence it interrogates. He maps the sensory inscriptions and erasures of war, highlighting war as a media that severs factuality from actuality to render violence just. He proposes that war promotes an anesthesiology that interdicts the witness of a sensory and affective commons that has the capacity to speak truth to war. Feldman uses layered deconstructive description to decelerate the ballistical tempo of war to salvage the embodied actualities and material histories that war reduces to the ashes of collateral damage, the automatism of drones, and the opacities of black sites. 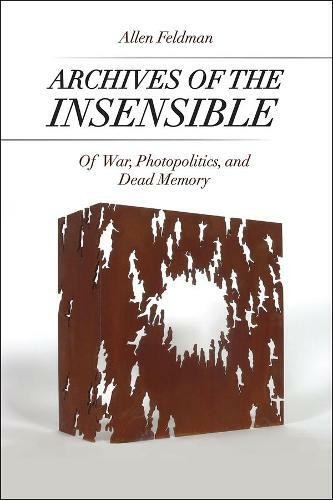 The result is a penetrating work that marries critical visual theory, political philosophy, anthropology, and media archeology into a trenchant dissection of emerging forms of sovereignty and state power that war now makes possible. Feldman delivers an essential dossier on the conceptual straitjacketing to which every terrestrial being, whether ethically bound or in the wild, is currently subjected. Scouring the political unconscious with exquisite precision and sovereign decisiveness all the while leaving intact the blurs and shudders of discursive power failures Archives of the Insensible will become the go-to work to help us confront unmanageably traumatizing realities by which we are seized and the cutthroat politics of our era. From media-theoretical downloads to subtle philosophical sting operations, the book doesn t let up. Ever. --Avital Ronell, author of Loser Sons: Politics and Authority"
Archives of the Insensibleis a remarkable diagnosis of our time, tracing with great subtlety the multiple ways in which violence is transformed into justice and justice gives birth to destruction. This is a startling book written with passion and insight, and a valuable contribution to our understanding of the relationship of violence to international law in the contemporary world. --Talal Asad, author of On Suicide Bombing"